ALEX BEAM has been a columnist for The Boston Globe since 1987. He previously served as the Moscow bureau chief for Business Week. He is the author of three works of nonfiction: American Crucifixion, Gracefully Insane, and A Great Idea at the Time; the latter two were New York Times Notable Books. Beam has also written for The Atlantic, Slate, and Forbes/FYI. He lives in Newton, Massachusetts. "Alex Beam, in his new literary biography, The Feud: Vladimir Nabokov, Edmund Wilson and the End of a Beautiful Friendship. . . gives us a brief but detailed sketch of how two erudite men of letters went from intimate confraternity to bitter enmity in the span of a few decades. . . Literary biographies remind us that even the gods are human ⎻⎻ primates, like the rest of us, just a few chromosomes away from the sapajous." 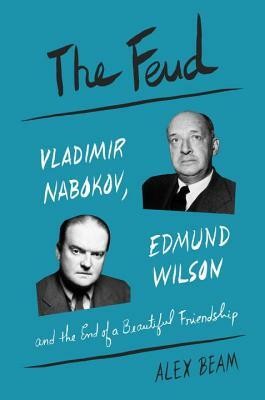 "The Feud: Vladimir Nabokov, Edmund Wilson and the End of a Beautiful Friendship is a relentlessly absorbing account of a sorry saga which stemmed from a difference of opinion, accelerated into a battle of egos and culminated in bitter loss for both adversaries. . .Was Wilson too scathing? Was Nabokov too thin-skinned? [Alex] Beam leaves those questions for his reader to decide. What he does, though, throughout his compelling book, is strikingly portray two brilliant but flawed men, and remind us that a rock-solid friendship can be eroded or destroyed by the combined forces of ego, envy and wounded pride." "Beam wears his learning lightly. He has a keen sense of the absurd and is mischievous but not malicious in exposing the foibles of these frenemies. He also, while he’s at it, has some Nabokovian fun as he laces his narrative with wordplay and faux-scholarly flourishes...his book mostly leaves you asking yourself how prideful and pig headed even the smartest men can be. If there’s a broader application to The Feud, it stems from that question, which doesn’t bode well for any of us." "Literary feuds can become the stuff of legend. Often sparked by equal measures of arrogance and insecurity, and fueled by wit and vitriol, the best provide great sideline entertainment for fans and detractors alike...Beam—a former Moscow correspondent and current columnist for The Boston Globe— makes clear in this slender, yet thoroughly researched and sprightly told account of the events, the rivalry was long percolating...What will interest readers, though, are the well-drawn, often unflattering portraits of two prickly, self-assured giants of 20th-century-literature, engaged in childish, if sharp-witted, verbal fisticuffs." "Beam's book evokes the strangely satisfying sensation of witnessing smart people bickering over seemingly small matters. It also provides a fascinating behind-the-scenes glimpse, full of anecdotal ephemera, of how Wilson and Nabokov interacted and why. But the more lasting sensation is the bittersweetness of this portrait of a fallen friendship—at its height, Nabokov wrote to Wilson, 'You are one of the few people in the world whom I keenly miss when I do not see them.' "
"The almost legendary tale of Vladimir Nabokov and Edmund Wilson's very public literary debate is told with great sympathy and skill by Beam... On one level it is a story of two titans of modern American literature coming to verbal blows over vocabulary and syntax, but more importantly, and more universally, it is the story of a generous friendship collapsing under the weight of reputation and the desperate need to have the final say. Beam is a natural storyteller and lucid scholar... The account of these two apparent geniuses devolving into bickering schoolchildren is endlessly readable and bittersweetly comic."